We are a team of laundry experts. Our delivery team, laundry facility team and management team’s experience through the years have given us a deep understanding about cleaning and delivering quality service. Contact us and we’ll keep in touch with you in whichever way fits your needs. We can be reached via our Hotline, SMS, Email, Skype or Viber. We have both Vietnamese and English speaking staff to assist you. Did you know many laundry and dry cleaning shops do not have their own cleaning facilities and instead outsource to others? Cosmo has it’s own laundry facility that only focuses on Cosmo clients’ items. We believe in giving our clients the best value for their money. Pricing is straighforward and reflects our dedication to providing affordable pricing while also not compromising on service or quality cleaning products. Frustrated with your current cleaner who does not deliver on time or provides poor communication and service? Cosmo was created to solve your laundry and dry cleaning problems with exceptional service! Comso Laundry & Dry Cleaning was founded in 2008 by a small, dedicated group of founders and employees who had one goal; provide superior cleaning services for those who expected more than the typical local company in Vietnam could provide. Initially starting with just 8 employees in a small, 100 square meter space, we have grown to over 60 employees with a cleaning facility that is over 1000 square meters. We serve all the major Districts of Ho Chi Minh City and are a preferred uniform cleaning supplier for many factories in the Binh Duong Industrial Zone. We strive to continually improve our services and facilities, utilizing management principles of Six Sigma and the best of Foreign Management practices to ensure we are meeting our clients’ needs not only today, but tommorow as well. In 2017 we expanded our retail valet shops in District 7 and into District 2, providing easy pick up and drop off locations for our indivvidual clietns. We look forward to continue to grow with our clients and the exciting Vietnam market. . When are you available for home pick up and drop off? We provide convenient pick up or drop at your home, office, or hotel 7 days a week. Our delivery people can pick up or deliver your laundry and dry cleaning normally up to 7 pm as long as you let us know in advance when you will be available. 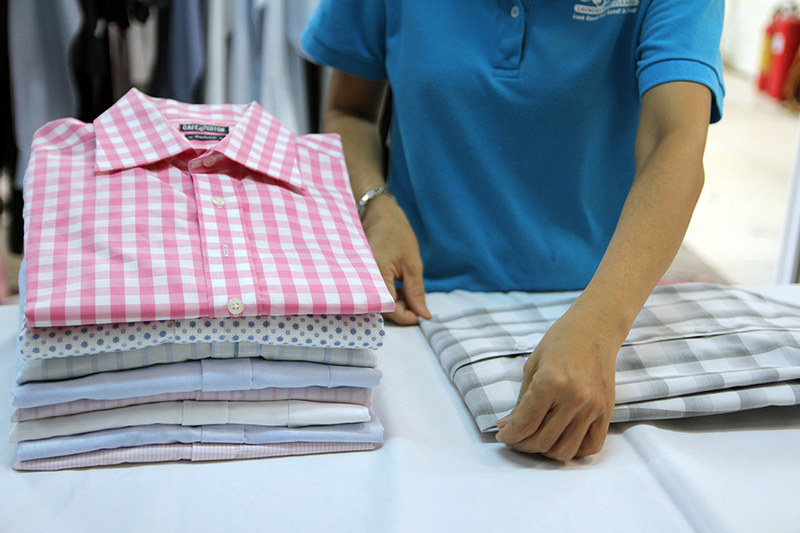 We always strive to be on time and we can call or sms you when your clothes are ready prior to delivery. Delivery service is free for orders over 300,000 VND. How long will it take you to launder my clothes? Normal turnaround time for laundry and dry cleaning is 48 hours after receipt of your items. We do offer same day, express service. Contact us to learn more. What Districts do you serve in on Ho Chi Minh? We provide services to all the key districts of Ho Chi Minh City including, but not limited to District: 1, 2, 3, 4, 7 and Binh Thanh. We also serve clients in Binh Duong. We not only have delivery service to these areas but also have Five Cosmo Valet Shops as well as a network of participating Circle K stores which make pick up and drop off easy and convenient for our clients. I have items that need special care, can you help? We are happy to discuss with you any items that may need special care or special handling. Feel free to contact us via email or phone to discuss your items and needs. Our experts in the Cosmo Laundry facility will ensure your items are treated carefully and are cleaned in the best way possible.